Atusaye Nyondo and Denver Mukamba netted either side of half-time as the University of Pretoria claimed only their second home victory of the season, beating Chippa United 2-1 in a league clash in Pretoria on Tuesday night. Nyondo racked up his fifth Premiership goal of the season before Mukamba scored after half-time to hand Tuks three valuable points, taking them to eighth in the league standings after 18 games. In their first game since the Premiership took a break in late December, both teams looked eager to get back into the swing of things, but it was Sammy Troughton’s troops that came out on top, thanks to a composed performance from his strikers in particular, who looked hungry from the outset. Taking charge of his first game since being hired in January, Ernst Middendorp had to watch on as his Chippa outfit fell to their eighth loss of the campaign, making a losing start to his tenure as Chilli Boys boss. The hosts settled quicker and were in with the first of the early chances, with Mukamba trying his luck from distance twice in the space of six minutes. Both, however, were straight at goalkeeper Mbongeni Mzimela. Mzimela would have hoped for more of the same from the Tuks attackers, but with Geofrey Massa hitting the side-netting on 19 minutes and then threatening again soon after, it looked increasingly more unlikely that he would have a quiet night in goal. His luck ran out 10 minutes before the break when a fierce long-range effort came flying in from Thabo Mosadi’s thunderous left boot. Mzimela parried the shot straight up into the air and struggled to get back to his feet, allowing Nyondo to swoop in and guide the ball over the line when it hardly needed a touch. Tuks carried their lead into the half-time break and looked content to sit back and defend their advantage after the whistle for the second period. Chippa, meanwhile, were hoping for better in front of goal, having managed just a single effort on goal in the entire first half, and a tame one at that. An inspired half-time change from Middendorp saw Erick Chipeta come on for Siyabonga Zulu. Chipeta, with his first touch of the ball, drew Chippa level after 53 minutes with a stunning header from Andile Mbenyane’s free-kick. Washington Arubi was beaten for pace and power as Chipeta scored his first ever goal for the Port Elizabeth outfit, giving Middendorp some welcome relief as he watched on nervously from the side. But his joy was short-lived when, just four minutes later, Mukamba sent Tuks back in front with his first goal for the Pretoria team, where he is on loan from Wits. Mukamba rounded-off expertly inside the box, clipping the inside of the post before the ball bulged Mzimela’s net for a second time. Middendorp made efforts late in the half to bolster his options in attack, but the former Bloemfontein Celtic tactician cut a frustrated figure on the side of the pitch, while his charges struggled to make any real impact in the dying minutes. Mhlengi Cele somehow managed to bungle a shot with two minutes left on the clock, the ball refusing to go into the net after a goalmouth scramble with Arubi seemingly beaten and on the ground. But that would be the last of the action as AmaTuks held on for dear life at the end, sealing the points in a game that only came to life in the dying embers. 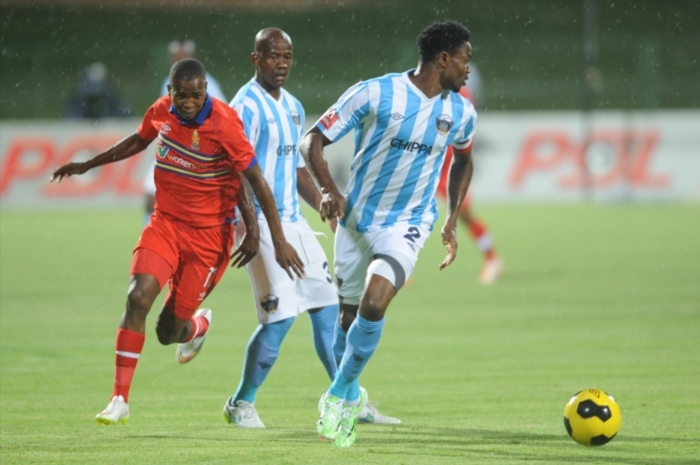 For Tuks, a fifth game on the trot without defeat, which as eased the pressure after a poor start to the season which threatened to derail their entire season.